I love my Popsugar Must Have boxes. There have been times when I've ordered THREE of the same month. Does that mean I have a problem? Or does it mean I'm the awesomest gifter ever?! I'm gonna go with.... both. We have a spoiler for the June 2015 box! We've been waiting for it and here it finally is! I'm subscribed for June already and I can't imagine I'd unsub anytime soon. I had to re-up my sub because it expired last month. Boxes have been selling out like hotcakes so I subbed the second they went on sale. 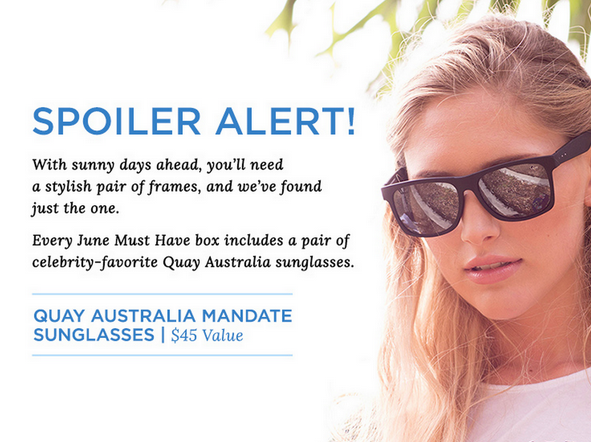 Everyone will be getting a pair of Quay Australia Mandate sunglasses! They aren't my favorite from the Quay line but I can always use another pair of sunglasses. I lose them at an alarming rate. What do you think?! I think it's a GREAT addition to a June box! I hope they fit and are somewhat cute on my face but really, I'll take anything I can get in the sunglasses department. 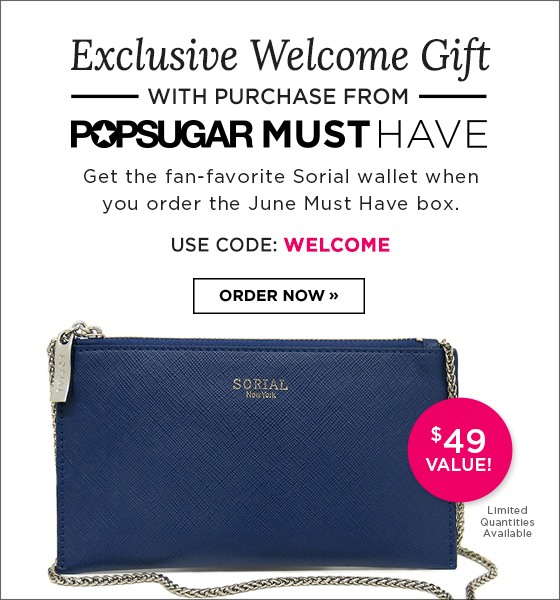 Sign up now for the June Popsugar Box! June hasn't sold out yet but I bet with this spoiler release, it's gonna go quick. Oh! And when you sign up, you can use code MUSTHAVE5 or REFER5 to get $5 off your box. you can use the code WELCOME and get a free Sorial Wallet on a Chain added to your box for Free! While supplies last the coupon will work. If you try and it doesn't, I'd love it if you let me know in the comments. I'm so excited I subscribed again and that this is what's included. I can always use a pair of sunglasses, hopefully they look okay! I'm with you on this. I can always use them but I hope they look good! Ugh I LOVE these but I have to wear prescription lenses (since I'm too lazy for contacts). 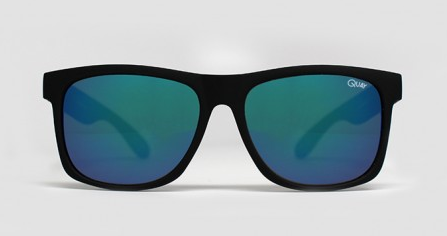 My prescription sunnies are very similar to these though. I wore glasses all my life until I got Lasik two years ago. Best thing I ever did and I'm loving the fact that I can just walk into a store and pick up a pair of sunglasses if I need to. And no switching prescription sunglasses to regular glasses when going in and out.